Inspired by some of DC's majestic monuments! Washington, DC is home to more than 20 memorials and monuments. One of the most famous is the Washington Monument, which was built in honor of George Washington, our nation’s first president. It was designed by an architect named Robert Mills. He planned the monument to be a 600 foot tall obelisk, a pillar with four sides that tapers or gets narrower as it goes up, with a statue of George Washington riding in a chariot on the top. When it came time to build the monument, the statue was eliminated from the design. When it was completed in 1884, the monument stood 555’ 5 1/8” tall. It is made of granite (inside) and white marble (outside). The World War II memorial in Washington, DC. Wikimedia Commons image. Not all monuments and memorials were built a long time ago. 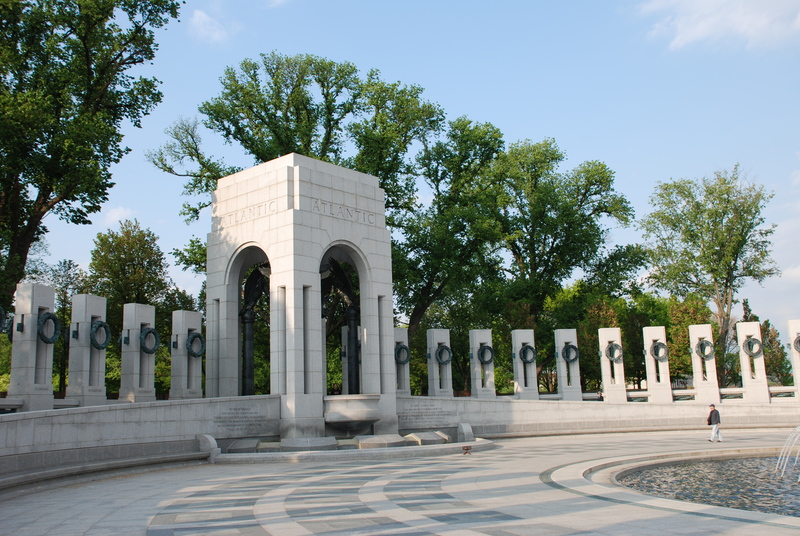 The World War II Memorial in Washington, DC was dedicated in 2004 to honor the men and women who served in the United States Armed Forces during that war. Designed by architect Friedrich St. Florian, this memorial is not a single building or statue, but is more like a park. It includes granite columns, bronze sculptures, fountains, and the Rainbow Pool. A monument is something built to honor or remember a person or event. It might be a building, a statue, or a pillar. If you could design your own memorial or monument, what would it look like? Would it be tall like the Washington Monument, or have columns like the World War II Memorial? Or would it have a look all its own? Think about who or what you would like to honor with a monument. It could honor someone famous or someone from your own family. It could commemorate a major world event or simply a day that’s important to you. Use your imagination and creativity to design and build a model of your monument! Think about who or what your monument will be about. Brainstorm ideas with your friends or family and then decide on your favorite. Get out your sketch pad and draw possible designs of your monument. What shape will it be? Will it be tall or short? Will it be a building or a statue or something completely different? Sketch a couple of different designs and then pick the one you like best. Using the construction paper or cardboard as a base, build a model of your monument. Be creative with the materials you use! The recycling bin is a great place to look for inspiration. Cardboard tubes can become columns and cereal boxes can be turned into buildings. What else can you reuse? Decorate your monument with markers, stickers, or other craft supplies. Take a photo of your monument and ask an adult to send it to Sparky at sparklab@si.edu! Be sure to tell us who or what your monument honors.